Personal testimonial: a few days ago my lights went out - like, really, several hours with no electricity. I like darkness, but darkness isn't conducive to doing the safety dance. A couple of days later, the revolutionary SolarPuff, by Solight Design, arrived. So I'm ready for next time, big time. What is it? 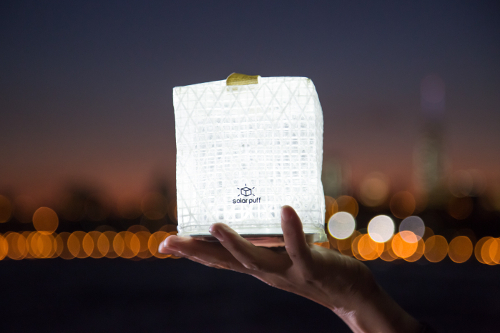 The SolarPuff is a remarkable invention, an ultra-light (2.6 ounces!) solar light source that packs flat and pops up into a soft but durable cube, with three settings: bright, brighter, and flashing (for emergency and/or impromptu discotheque use). Eight hours of bright sunlight nets eight to twelve hours of convenient, portable lighting from its ten powerful LEDs. But the SolarPuff is more than just a fun, new gadget. 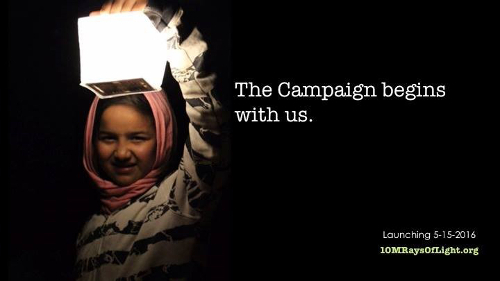 In a world with more than a billion and a half people lacking electricity and clean, sustainable lighting - including many struggling with poverty, refugee status, and natural disasters - Solight Design's mission is to bring light to those struggling in darkness. In addition to the world's electricity problems, many in North America live in darkness: from First Nations reservations (currently, according to the U.S. Department of Energy, approximately 40% of Navajo Nation homes lack electricity) to inner cities and rural, poverty-stricken areas. 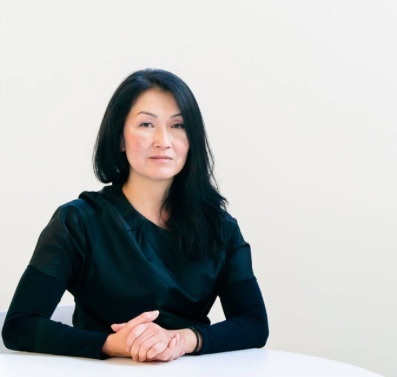 It was my privilege to speak with the SolarPuff's inventor and designer, Professor Alice Min Soo Chun, as well as Solight's global brand ambassador, uber-philanthropist Dr. Alison Thompson. I've learned about this light, which is miraculous, very recently. 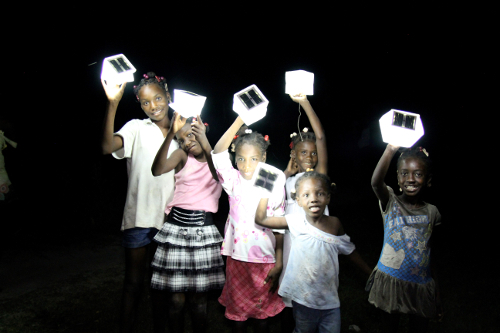 Did the Haiti earthquake lead to the SolarPuff, or was it already in development? The origins: I'm a professor in architecture, and I've taught at Columbia University, and the University of Pennsylvania. I started to research solar energy and renewable energy, after the birth of my son, when he was born with asthma. I was going to the doctor's office all the time, and there would be so many kids sick with allergies, with steroids being pumped into their lungs - having trouble basically breathing! One out of four kids in New York has asthma, and it's 40% higher than the rest of the country, due to our addiction to fossil fuels and energy consumption in buildings, which cause 75% the pollution in our air. One light bulb can create up to 90 pounds of carbon emissions per year! So I realized that we all have to start changing the way that we harvest our energy, to get away from fossil fuels - because it's making our children sick, it's making us sick, it's making our planet sick - and so that's when I started to experiment with solar panels. Also, I grew up very poor, and I used to make my own clothes, and so fabrics, and textiles, are a very inspiring material for me. Along with that, I teach courses on material technology. Things are getting lighter, faster, thinner and stronger, and smarter. And so this substrate light fabric was ideal material for me to start experimenting with solar panels and simple circuits, hooked up with LEDs. I received a grant to develop this stuff, and right after that, the Haiti earthquake happened - I was teaching at Columbia University at the time - and I quickly changed my studio from architecture into an innovation studio - so I shared all of this research and technology with my students. One of the first prototypes was a solar, inflatable pillow - but I decided that the inflatable model, with a mouth-nozzle, was not good for third-world areas. When disaster strikes, sanitation is a big issue: cholera, Ebola, and now the Zika virus can all be transmitted through saliva - so I wanted to get rid of that mouth nozzle, and then I developed the SolarPuff. I continued to use sailcloth fabric, which I thought was an ideal material, and it also created a beautiful spectrum of light. But most importantly I think it was the research, when we realized Haiti was a microcosm for what was happening globally: that wherever there was extreme poverty, people were using kerosene lanterns to light their world at night. It's a $38-billion industry - and people were spending up to 30% of their income on kerosene, when they're only making $2 a day. I thought that was criminal. And it kills two million kids a year, the kerosene. Yeah, exactly! 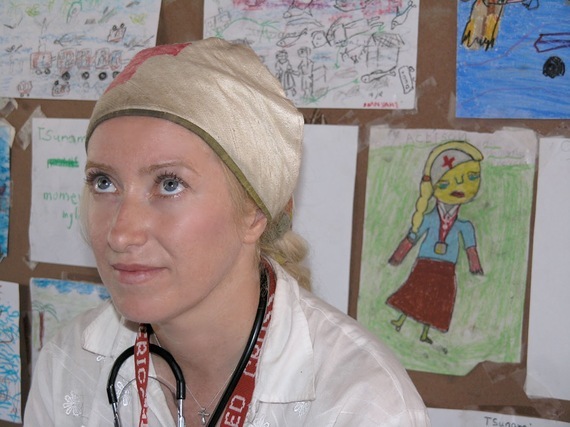 Two million children die a year, from the bad toxins from kerosene lanterns. I met this woman in Haiti, she had five kids, and she couldn't afford the glass to go around her kerosene light. The kids were doing homework in this smoky, dim room every night. When I gave her one of my prototypes of the SolarPuff, she said it was a gift from god. We ended up calling her later on, to see how she was doing - this was early on in 2010, or 2011 - and she said people in the village kept asking to borrow her light, and if there were any more - so that was one of our earliest field tests. We did three years of field tests before we actually launched our product, last year. The potential for this, globally, is actually kind of staggering - I mean, for the transformation it can bring to our health and planet. There are 1.6 billion people in the world without light. I've been sitting in refugee tents and camps for the last 16 years, and I've pretty much been pitched everything out there, from really expensive solar lights, and contraptions, and water filtration, but the first time - when Alice showed me the prototype [of the SolarPuff], and I'm looking at it: That's the first thing I've ever seen that's accessible to the people in the street; that's something simple, they can afford, and they can put it in their pocket! So we stayed in touch, and started working together, and then we've just been taking them ever since, all over the world: to the Nepal earthquake, high up in the mountains, and all through Haiti, and now with the Syrian refugee crisis for the last 11 months, all through the camps - because when they were landing, they would land in pitch-black darkness, and we had over 10,000 landing a day. But at night, there were these women and kids, and babies, everyone trying to walk 31 miles up a very steep hill to the refugee camp - which was also dark. 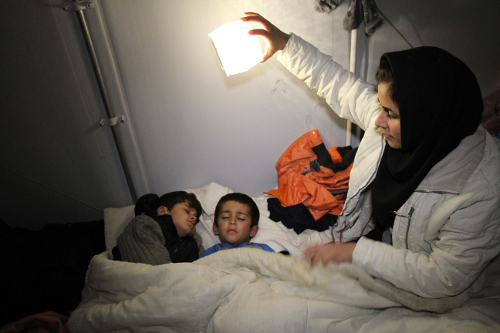 We started handing them out to the refugees, then started going throughout all the camps, and the needs were so high, and it's so dark in Greece, that I would just keep getting emails: "Please come to us! Please come to us!" We're the only group taking them to Greece, and I'd just keep coming in and out, every two weeks, and restocking more lights. I just see this great transformation of these refugees sitting, so miserable, in these really dark tents - and I walk in, and I give them to the kids: and they automatically start laughing and singing! They're singing songs of praise, and: "Thank you!" It's just the greatest experience you can have. I'm the biggest fan of the SolarPuff. I see what it does in these communities. 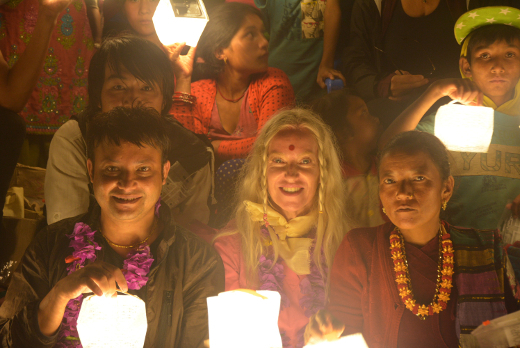 And even in the highlands of Nepal, they've never had electricity. We climbed 10 hours into the mountains, with leeches and monsoons, and people would walk for days to get to an area on top of a mountain - to meet the magic lights! They celebrated all night long, and would dance and dance! With no food or water or anything, it was these lights, thousands of lights! That's why I'm involved: I'm about giving love and light to the world. As I said, there are 1.6 billion people without electricity and light. There's just such a need, and I'm ready to take it to the ends of the earth, because it's so important: it's up there with basic food and water. That's the short version! There are a lot of journeys in between it all. The solar light industry - it's a huge market. It's a B.O.P. market - a bottom-of-the-pyramid market. But we're struggling, because we need to scale up so that we can get our costs down, so that people that are living on $2 a day can afford to buy this light. I'm grateful to be involved. Some of what I do is purely entertainment-based, but I grew up with the Secret Policeman's Ball shows and Live Aid - so entertainment-meeting-philanthropy has been part of my DNA all along. The 10 Million Rays of Light campaign - how's that going? One of our team members, Lara Lavi, is in the entertainment industry, and she's our company's general counsel. She's also a musician, and realized we could tap the social media reach of musicians everywhere to be part of the 10 Million Rays of Light campaign and celebrity challenge. She spearheaded this whole campaign of Ten Million Rays of Light - which is about: buy one and give one, kind of like the TOMS Shoes model - and we were also inspired by the ALS challenge. What we are doing is having everyone do a video of holding the SolarPuff, and saying: "I'm one of the 10 Million Rays of Light, you light up MY life because... - pass on your light" Basically sending a YouTube video to someone in your life. This is through our non-profit, FAARM, and the 10 Million Rays of Light. We're not just selling a light; we're selling the idea of a light in all of us: that we all have an inner light, and we have the power to make a difference in this world, no matter how small the effort, or how large your vision.